I'm a totally candy whore. I love candy. I thought I would grow out of it as I got older but nope. Here I am at 40, still snagging a box of Lemonheads at the store every now and then. 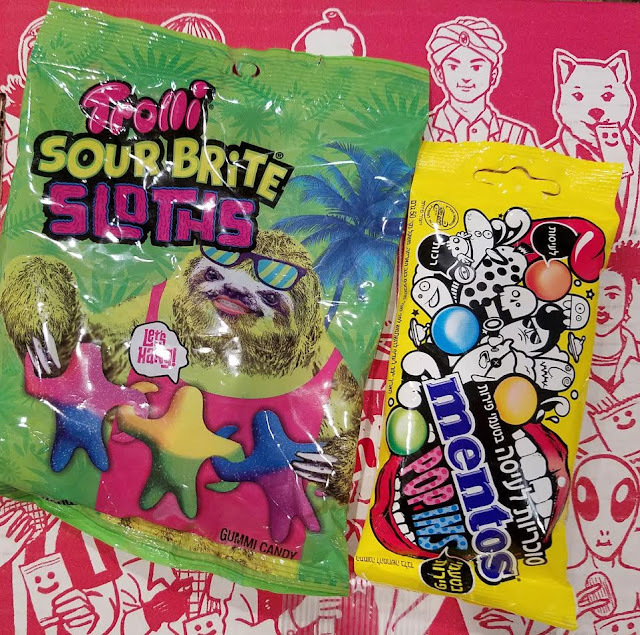 Sour is also my favorite food group so I was pretty happy to see these. The Trolli Sloths are typical Trolli. Chewy and not sour enough! Surprisingly, these Mentos were great! Blueberry was my favorite flavor. There was only ONE green one (apple) which made me grumpy. Why do companies do that? It's like they know the good flavors are coveted and therefore make less of them. When was the last time you had more orange Skittles than grape? Never happened to me. 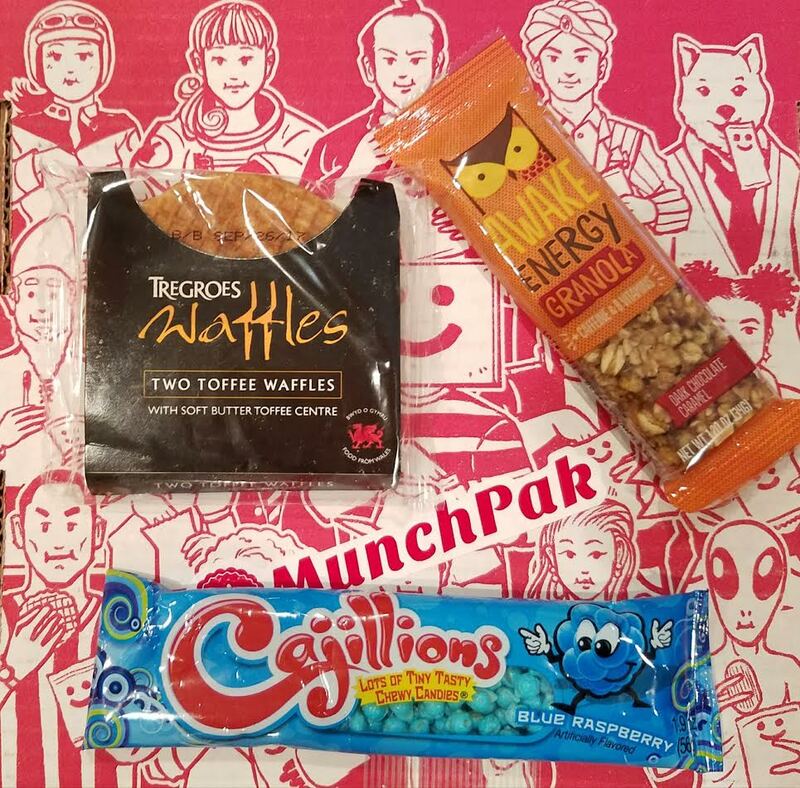 This MunchPak had a great selection of sweet and savory. I absolutely appreciate that. It's always a bummer when everything in the box is the same genre. This was not a problem with this delivery. I've had the Tohato Caramel Corn before. It's like sweet cheeto puffs. Kinda weird but not bad. The Sriracha Almonds were snarfed by my husband who pronounced them spicy and delicious. My mom loves Stroopwafels. These don't say they're stroopwafels but they are basically the exact same thing. I'm saving these for her because while I enjoy them, I had a million of them when I was in the Netherlands. In the midst of all the candy and crunchy snacks, there is a lone healthy item. I tend to consider granola bars more healthy anyway. This one has caffeine and is Dark Chocolate Caramel. Hm. Maybe it's less healthy than I was imagining. Cajillions must be another country's version of Nerds. Except they're chewy. Hm. They're growing on me. 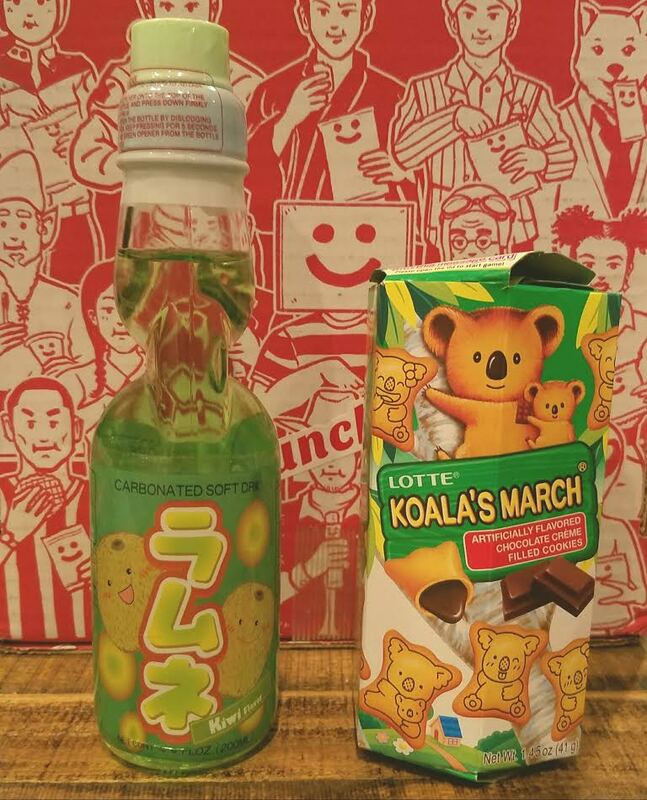 This is a ramune kiwi flavored soda drink. I'm assuming it's Japanese since the first time I had one of these was in Japan. I love the ridiculous and slightly confusing way of opening it but it didn't taste as amazing as I was expecting. Also, for $5 it's on the pricy side for an add-on. Lotte Koala's March is chocolate filled wafer cookies with koala's printed on them. Super cute, taste okay but I'm partial to those Keebler elf cookies. I discovered Pretz in a snack box and have been trying flavors ever since. Salad is still my favorite but these Pizza ones are right at the top of the list, too. They're basically savoury Pocky sticks. 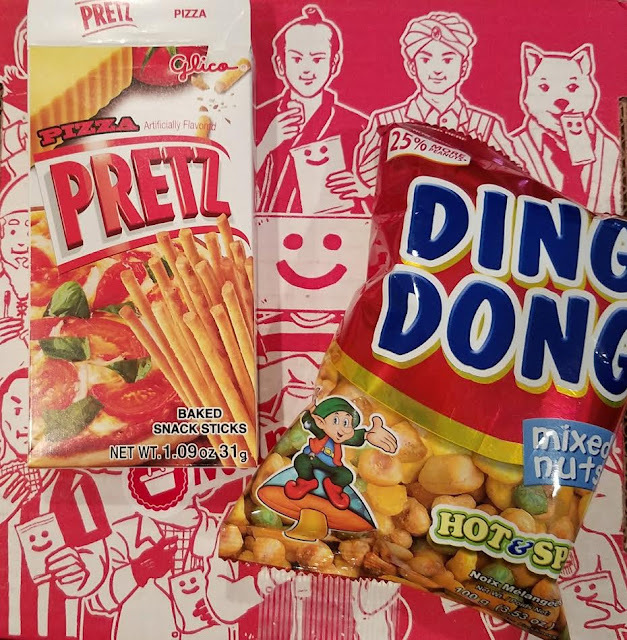 The Ding Dong Hot & Spicy Nuts were donated to my husbands cause. 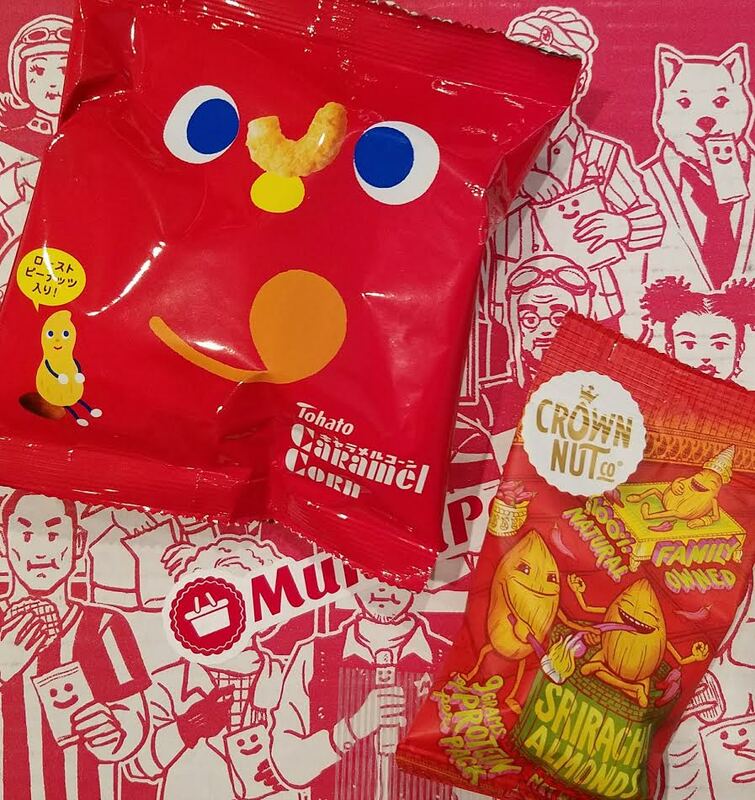 He enjoyed them probably because the bag was a good size and it didn't have just nuts. The mix included corn and peas. VERDICT: If you like eclectic snacks and you don't really have a preference regarding what is sent, this is a fun way to get good sized snacks and treats. I appreciate that everything is full size, although I have to add a caveat that full size in the US is not the same as full size in Asian countries so this doesn't mean you're going to be getting gigantic bags. Still, it's a great mix! If you DO have preferences and you're willing to pay $1 per option you can request not to get spicy products or say yes, give me all the sour. 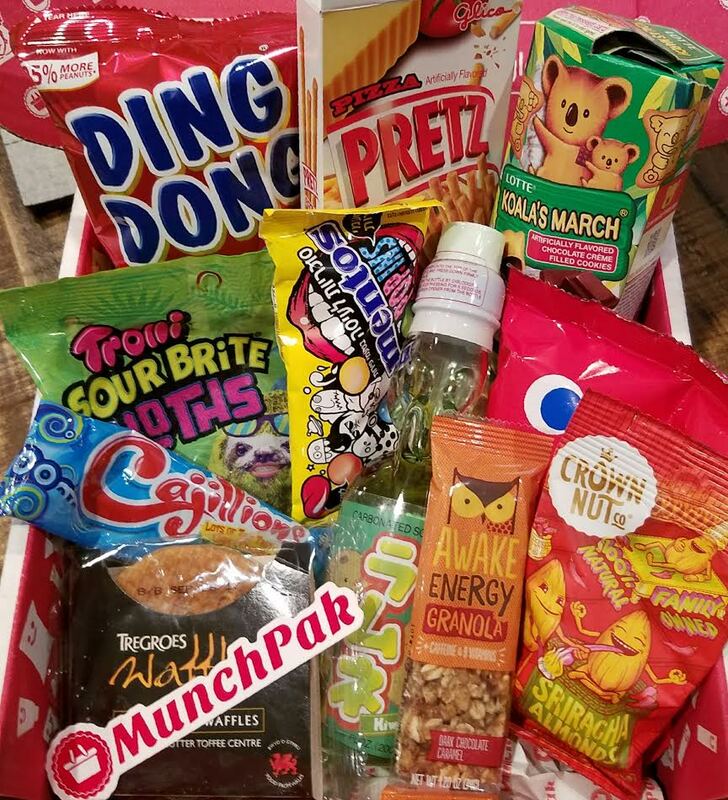 Adherence to your preferences is done based on the candy in stock at the time of packing your box so if you love sour but there are no sour candies, you won't get any. I doubt it's quite that dramatic but I thought I'd mention it. *This box was complimentary for review purposes. All opinions are mine. Affiliate links were used in this post. Those cajillions made me laugh- we have them in the UK but they're called millions...how original! And they're chewy too. I can't eat too many cos they make my tongue hurt?! One thing to all-- use IE instead of Chrome when subscribing. The website form will not accept Chrome. Thanks Amanda!! It's been quite exciting around here (and not all of it the good kind) but I've gotten so much done I'm feeling very satisfied. I hope you're doing well! How are your sweet pups? !